Above: Aerede founder Emily Mathieson displays a few of her life-improving homewares. Photograph by Emma & Kiri. What does a journalist with a social conscience and a love of life’s finer things do when the demands of being a travel editor become too difficult to manage with a young family? If you’re Future Fabster Emily Mathieson, you combine the two and start Aerende — an ethical interiors, life-improving homewares shop whose lovingly sourced collection of handmade items are created in the UK by people who face social challenges. Produced in low-volume batches and designed to improve with age, each purchase directly supports and provides opportunities for the makers while treading lightly on the eco-footprint of our collective world. While Emily may be a decade away yet from becoming a Fabster — Fifty And Beyond — her wise spirit and dedication to making the world a better place, as witnessed in her beautiful and thoughtful Instagram feed, are qualities that are not bound by age. We catch up with her to discuss the importance of conscious consumerism and her vision for the part that Aerende can play in this discussion. 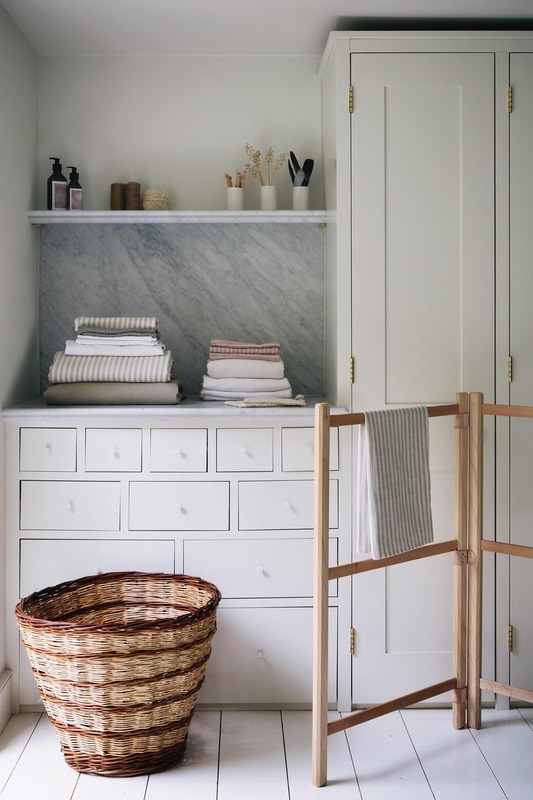 Above: A Wicker Basket, Wooden Clothes Horse and varied Linens are a few of the life-improving homewares sold at Aerende. Photograph by Anna & Tam. Fabulous Fabsters: Please tell us about the genesis of Aerende. 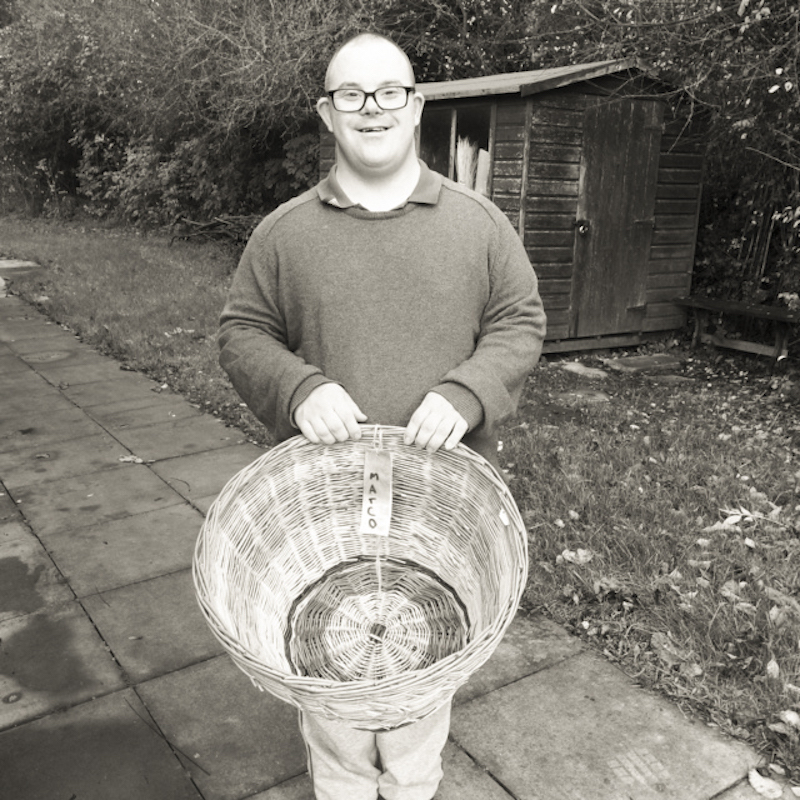 Emily Mathiesson: The idea for Aerende really came to fruition when I bought an amazing wicker basket, made by people with learning disabilities, at a craft fair near my home in St Albans in Summer 2015. They explained that they had only sold one that day and I knew that if they could reach a wider audience the baskets would sell really well, raise the makers’ self-esteem and increase revenue for the charity that supports and teaches these meaningful activities. I spoke to a number of other charities and organisations who felt passionate about the benefits of their creative work but lacked the skills or inclination to create a brand and sell online in a more organised and up-market way. So began the Aerende journey. The combination of our makers’ amazing techniques and products and my enthusiasm for telling their stories has come to fruition in the store you see today, which launched in autumn 2016. Above: Marco is now of the weavers at the basketry at Delrow, the Camphill Village Trust community near Watford. FF: Please tell us a little about what you did before you started Aerende. EM: Looking back, my university years where I read Classics and Social Sciences in Manchester — a thrillingly dynamic city — seem to have provided the seed bed to where I am now. I was very involved in Community Action, eventually managing the soup run, which saw us making and delivering soup and sandwiches to homeless people in the city centre. Fun fact: One of my fellow soup runners at the time was Rob Rinder — better known as Judge Rinder. I’d also dabbled with student journalism at university (alongside Merope Mills now executive editor of The Guardian) and decided publishing sounded fun. My first job out of university was working for a public sector magazine company in Stockport. I soon moved to London in search of glitter and excitement and ended up as a sub-editor on Esquire where I met my husband, Jon. This was a stepping stone to nearly two decades of work as a staffer and freelancer on travel and lifestyle magazines (including as commissioning editor of Condé Nast Traveller and travel editor at The Guardian and Red). I loved the many talented people I worked with (and the perks) but by the time there were two children in the mix, I was finding it hard to manage the workload, the travel and the networking alongside my family’s needs. I also felt increasingly uneasy about the environmental and social impact of my work so started thinking about ways to balance a desire to make a difference with a love of life’s finer things. Charity and voluntary work kept coming up in the discussion but in the end I felt I wanted to start something so that I could run a business whose impact I could see and feel. As interiors have always been a passion, the idea to combine the two resulted in Aerende, a homewares shop selling products made by people facing social challenges. Our philosophy is to challenge stigma, create opportunity and show consumers that you can shop and do good at the same time. 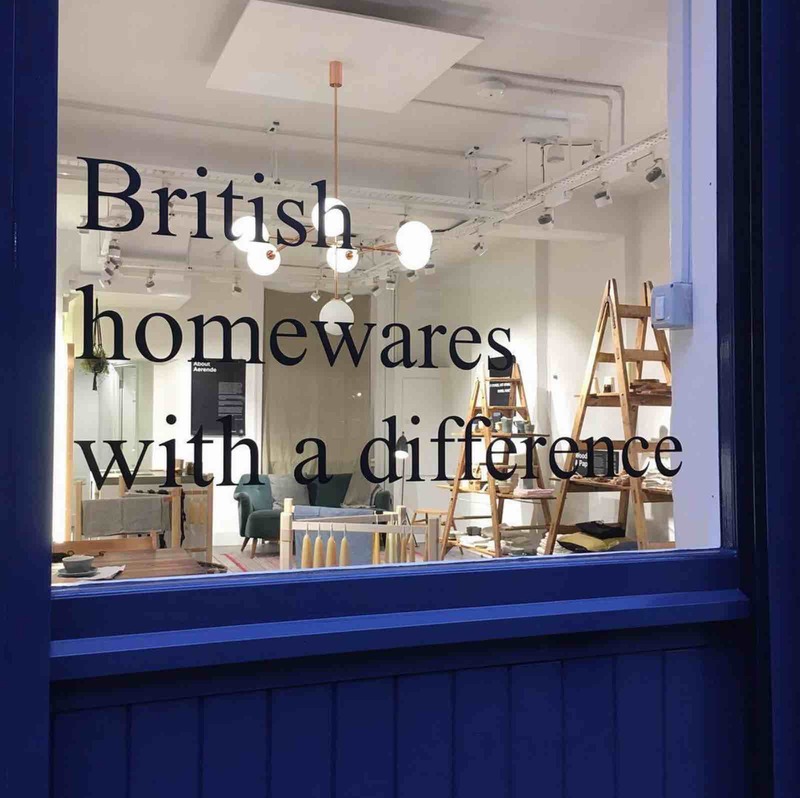 Also, as there is a growing awareness among conscious consumers about ethical fashion and food, I spotted a gap in the market for a truly ethical British interiors brand. I wanted to be at the forefront of that movement. Above: Emily met her husband Jon when they both worked at Esquire magazine in the early 2000’s. 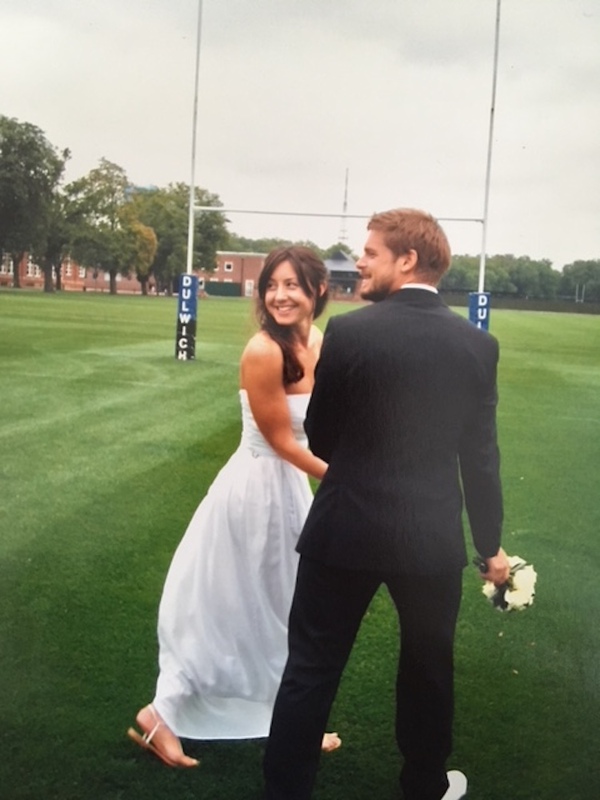 “We got married in 2007 — a super-budget eco wedding down the road from where we lived in South London,” she says. FF: Why a social enterprise? EM: I’m a big believer in the idea that spending money is a vote for the kind of world you want to live in and that business can be a great driving force behind social change. Social enterprises like mine are a showcase for a new kind of model that uses capitalism to solve some of the problems it creates and recognising that business can be a huge force for good, not just in the way a company is run but in how it can influence consumers to think more deeply about their purchasing habits. Hardly anyone in the UK is talking about ethical interiors or ethical gifting so I really feel that our products have a necessary place to help fuel those conversations. FF : How did you come up with Aerende for the name? EM: I wanted a name where our brand values, which I genuinely believe, could be enshrined. Aerende (pronounced air-en-day) is an Olde English word that means care or message. FF: Please tell us a little about the challenges of starting your own business. EM: There are so many! Retail is much more demanding than I naively imagined. You have all the normal requirements of running a business but now have to be great bloggers and social media masters too. I don’t have a background in manufacturing or design so product development (though wildly exciting) can be a tricky process and, of course, many of my makers face so many of their own challenges that volumes, consistency and deadlines don’t happen in a conventional way. Building a loyal customer base takes time too, and keeping the shop going outside of the busy Christmas period is a challenge. 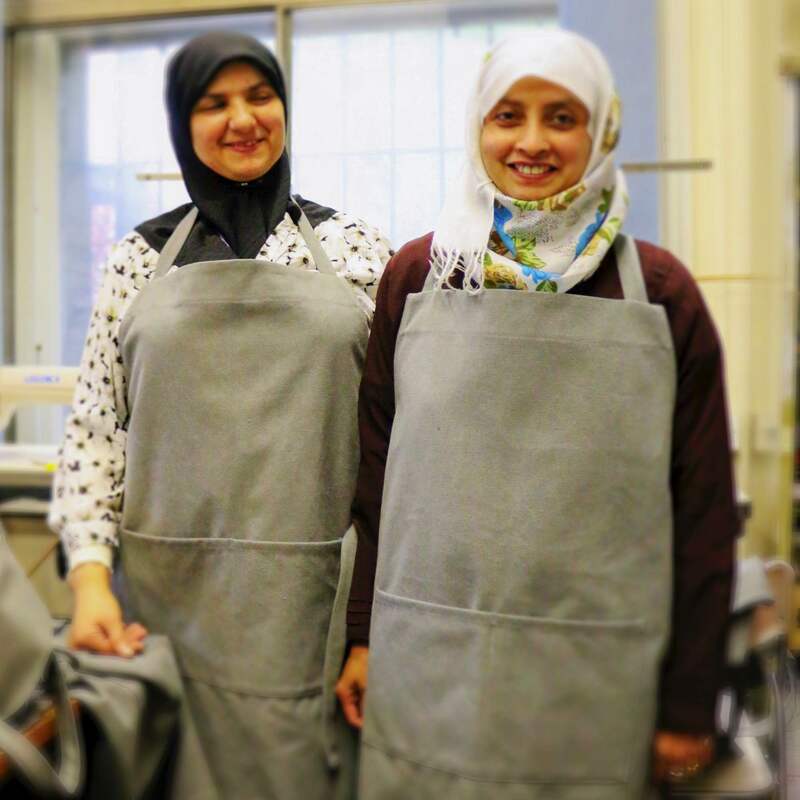 That’s why I’ve launched a bespoke arm with our refugee sewers – to ensure we can keep them in work year-round by taking orders from big restaurants (such as Petersham Nurseries which will open with our tea towels as part of the staff uniform in April) and interior designers. Being picked by StudioIlse to supply Massimo Bottura’s Refttorio Felix in Earl’s Court was a huge thrill for everyone involved in the project because I’ve admired Ilse Crawford and her team’s work for years and loved the ethos of the community kitchen restaurant – showing people who are vulnerably housed or homeless that they are valued by taking the design of their eating spaces seriously. Above: Fatheha and Malika are the women behind Aerende’s bed linen and macrame plant hangers. They are part of a team of long-term unemployed women supported by the FabricWorks Social Enterprise in East London. FF: What were/are the challenges particular to a social entrepreneurship? EM: Well, social enterprises should run like other business but it’s easy to get so caught up in the social and environmental benefits that the economics get pushed to one side. Ultimately the challenge is about finding the balance between the three to run a truly triple bottom line business where success is measured equally according to economics and social and environmental impact. Because Aerende is a non-profit, funding has been really challenging. We don’t offer shares in the company because I don’t want to focus on profit for personal gain, but it’s not a charity because I believe enterprise is a more constructive way to support people and make long-term differences. This means we can’t attract typical investors and we’re not eligible for many grants. So, at the moment cash flow is the hardest thing. Because we can’t grow without an injection but are limited only to philanthropic investments and very specific grants to do so. Even things like new labels become a challenge as the cheapest and most efficient option doesn’t always fit with our aims and objectives. I only dropped what I felt was an essential commitment to organic cotton on our washing labels when I called People Tree and they told me they didn’t use organic cotton for theirs because it was too cost prohibitive. Sometimes it’s good to look to other ethical companies for inspiration, and to see what compromises they’ve been prepared to make. 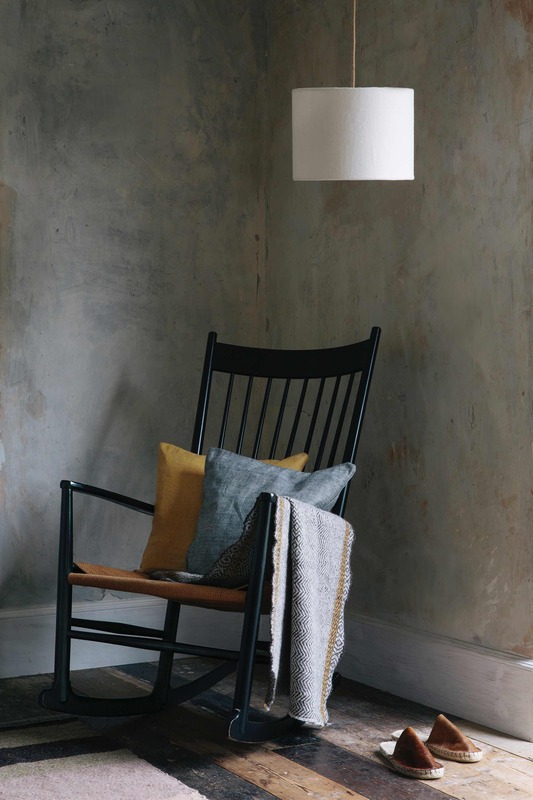 Above: A mix of homewares by Aerende — Two Tone Mustard Linen/Cotton Cushion, Grey Cotton Cushion, Wool Chevron Blanket and Backless Slipper Espadrilles. Photograph by Anna & Tam. FF: Please tell us about some of the partnerships/collaborations you have set up. EM: Almost all of our makers are supported by wider companies and charities, many of whom have not really traded outside of their own doors before. One of the first organisations I approached when I was researching the business was Studio 306, a creative programme for people recovering from mental health illnesses. They now make our beautiful Porcelain Tea Lights and Ceramic Candle Holders and now have such a good idea of the things I like that they are always coming up with brilliant new ideas, including some hand-hammered brass dishes that should be on sale later in spring. Another of the really rewarding partnerships has been our refugee sewing programme. I set it up after the Refugee Council approached Aerende to see if we could provide work for a recently arrived Syrian woman who loved sewing. We started last year with one sewer and a small textile range that includes Aprons and Napkins. This has now grown into a weekly meeting of 4-5 refugees who come together to share conversation, skills and, on the best weeks, delicious Syrian snacks (the church hall we meet at has vines growing outside it and one week all the women picked the vine leaves and returned the following week with amazing Arabic dolmades). Although the language barrier can make communication slow, we’ve developed some brilliant non-verbal language around napkins and cushions and it’s really rewarding to see them gain in confidence — hopefully to the point where they can run the project themselves. It’s proved really popular with corporate companies and private clients but is expensive to keep going (in terms of high quality textiles, sewing machines, premises, sewing tutors and so on). We’re hoping for a rich benefactor to come along and help support it financially to really find its feet as we believe the model is one that could be rolled out to huge benefit across the country. In terms of other collaborations, we’re working on one now with broadcaster Rosie Birkett who brings a love of colour and youthful energy as well as a more trend-focused eye to things and I am talking to a couple of interior designers and stylists about white label ranges (special edition items for them but made by us). Other dream collaborators would be with DeVol, Plain English, Selfridge’s, Liberty, Daylesford, Community Clothing, Margaret Howell, Paul Smith and Toast. We’re working hard on developing our wholesaling arm so that I can start approaching these companies with actionable ides. FF: How has social media played a part in building up Aerende’s profile and audience? EM: I love social media and there’s definitely an Aerende fanbase there. I’d even go so far as to say Instagram and Twitter have led to some superfan brand ambassadors. However, there’s still a critical role for traditional press and established blogs that take content seriously rather than just chasing “likes” and social media status. Social media is so instant I think it’s easy to disappear into the fray. And to get hung up on “likes” or to think they’ll equate to sales, which of course they often don’t. Above: Aerende’s pop-up shop with space provided by Appear Here near Borough Market in October 2017. FF: Name 3 high points so far since you launched Aerende in Autumn 2016? EM: Winning Appear Here’s Spaces for Ideas Competition and all of the associated events including opening a pop-up shop; one of our lovely maker groups saying they couldn’t continue their creative therapeutic work without us; seeing Aerende products in peoples’ homes – bringing joy and being used – just what all objects should be for. And a fourth: being featured on Remodelista (one of my favourite interiors websites and the inspiration for both of the house renovations I’ve done in the last decade) as an ethical interiors brand to watch. FF: What do you love most about your work with Aerende? EM: I feel mentally stimulated every day and it’s genuinely a joy to get out of bed for. It’s such a great feeling knowing that you’ve made something that satisfies your own creative needs but that also helps to facilitate other people’s creative journeys and hopefully improved self-confidence, mental health and physical wellbeing too, plus having a wider benefit of creating conversations about the way we consume and what it means for us as a society. 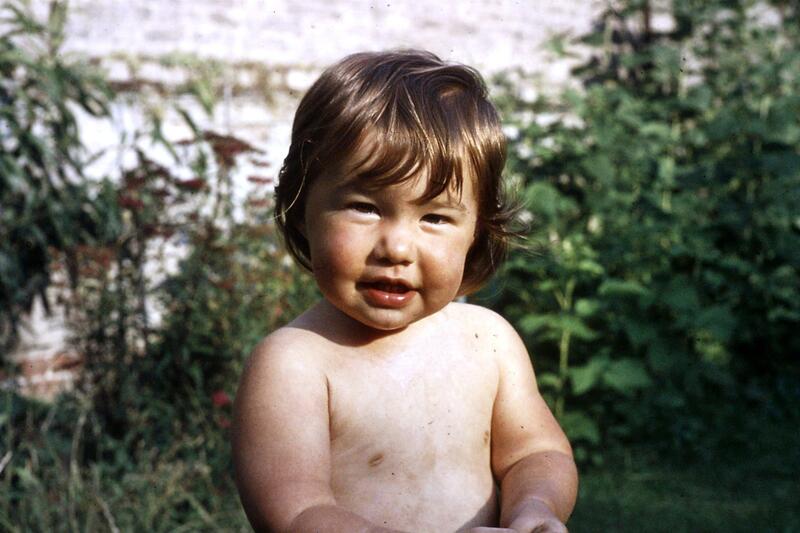 Above: A young Emily in the garden, starting early on acquiring her green credentials. FF: What are you most proud of? EM: Knowing that we’re inspiring conversations about how to make more thoughtful and meaningful purchases for our homes. And discovering an unknown enthusiasm for business — creating income and getting it going rather than just talking about it! FF: Where would you like to see Aerende in 5 years? 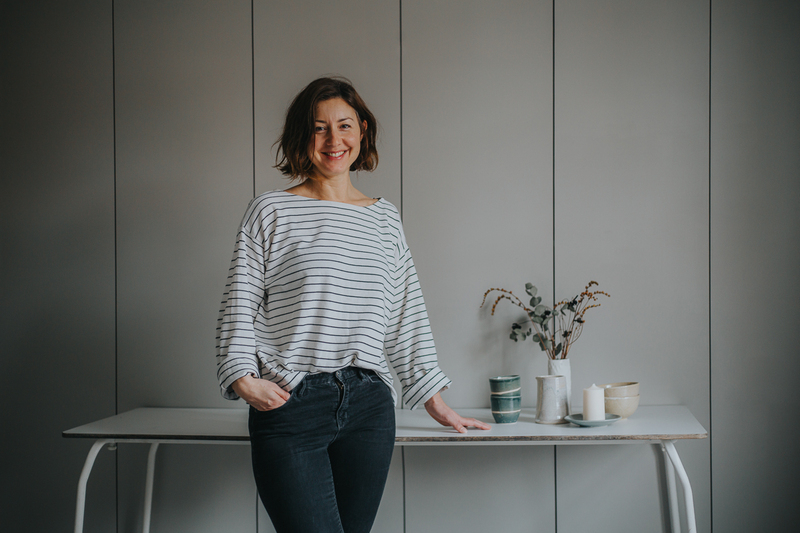 EM: I’d like to be recognised by a small but discerning set of people as a benchmark for ethical British interiors and to be a go-to for people who want beautifully packaged, timeless and ethical gifts. 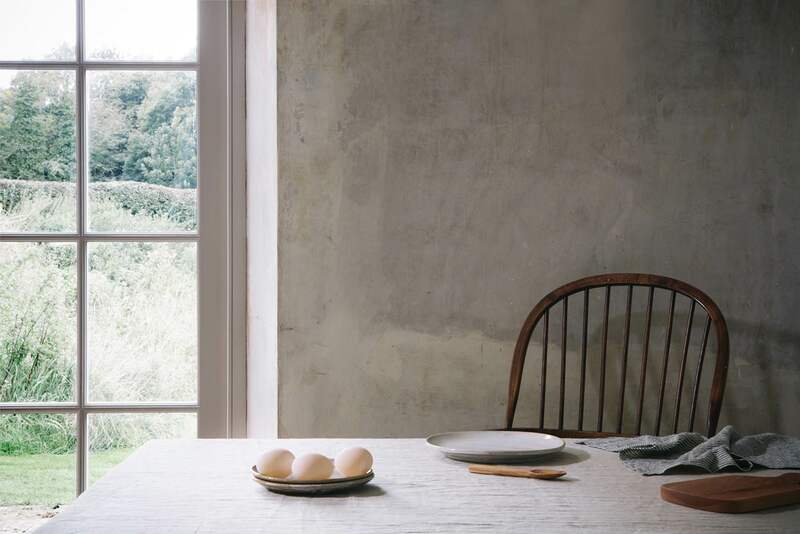 Above: Tableware from Aerende includes Stoneware Dinner Plates, a Linen Tea Towel, an Elm Chopping Board and a Hand Carved Cherry Spoon. Photograph by Anna & Tam. A Fabulous Fabster thank you to Emily Mathieson! Thank you, Christine & Emily, for a great interview, I’ve enjoyed reading Emily’s latest news. I’ve always thought her idea was utterly brilliant and it’s good to see Aerende developing in so many different ways. Many thanks for your feedback. It has been so inspiring for me to see how Emily has developed her idea from the beginning into what Aerende has become. Looking forward to seeing what she does next. Judy, You were the first person to ever write about Aerende so you are very much part of the story. I’m so happy you’re still following along. Thank you! Excellent article and an exciting business project but there is a big weakness here that should be addressed swiftly. When owning a small business and you get such welcomed and supportive publicity, it is a huge failure to be out of stock of anything on your website Emily!! Hi Anna. I’m so glad you like the business concept and really appreciate your comment. I am very grateful for this supportive publicity and recognise that being out of stock of some items can be frustrating for customers. As I mentioned in answer to Christine’s questions, it’s been a really tricky balance to maintain our inventory while managing cash flow and the specific needs of our makers. As every item is handmade, and as our makers may have a variety of obstacles to completing items within conventional timeframes, it sometimes takes more time than people may be used to to restock. I try not to take things off the site when we run out as this is demoralising for makers working hard to recreate them and takes away the opportunity for customers to register their interest for when items do come back in stock. It’s very much an issue I’m aware of and am trying to improve by working hard to come up with solutions that work for our customers and our makers. I would really welcome any advice on the best ways to do that (in case anyone reading is an expert on cashflow, social investment or ethical retail). But just to reassure you that I take these comments seriously I have now taken down some of the items that have been out of stock for more than 8 weeks and look like they may be tricky to replicate in necessary volumes moving forward. I do hope you’ll come back to the site in the future and see more items available. Thank you so much Deborah. Your kind words and support really mean a lot. I just love Emily’s idea for Aerende. What impresses me most is the constantly high design sensibility. The products are really desirable and to balance this with such integrity of social responsibility is amazing. Good luck Emily, great interview. Yes, I couldn’t agree more — Emily has done a wonderful job with Aerende! Such a great idea from inception to execution.